Tokyo Sexwale withdrew from Friday's Fifa presidential election because he was "realistic" about his chances and also wanted to create a sense of calm. The South African told BBC Sport he used his candidature speech at the congress in Zurich to "break the ice, because there was a lot of tension". 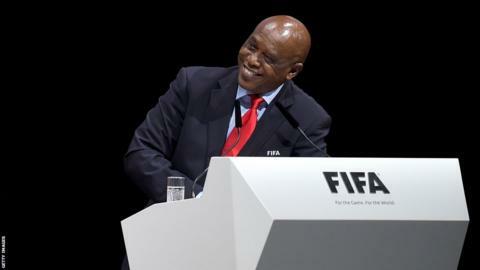 Sexwale feared the atmosphere could lead to a "messy election". His withdrawal left four candidates in a vote which was won by Gianni Infantino, who succeeds Sepp Blatter. Sexwale, a former anti-apartheid activist and millionaire businessman, gave a speech that mixed the serious with the jovial before leaving to a standing ovation. "I am from the country of Nelson Mandela, who preached reconciliation, and I could feel the tension as we built towards this congress," added Sexwale. "I felt I needed to play a role to break the logjam. "It made me very humble," said a man who was incarcerated for his anti-apartheid stance alongside Nelson Mandela on Robben Island. "The reaction by many people was that we were able to break the ice and people were able to relax. It opened it up for people to now talk ideas, not hostility, tension or that sort of thing." Prior to his entertaining and wide-ranging speech, the 62-year-old's quiet campaigning had left many observers wondering where his votes were going to come from. Earlier this month, Sexwale was even called before the South African Football Association to explain the perceived lacklustre nature of his campaign. The sole African in the race also failed to receive the support of African football's ruling body the Confederation of African Football, which asked its members to vote for Sheikh Salman. The Bahraini had been the pre-election favourite but lost both rounds of voting to Infantino. "There were many people back at home who did not even want me to leave the blocks," Sexwale explained. "If I was out there contesting, people were saying 'don't do it', others had an agenda while others didn't even want me to leave the continent (to campaign). "It was my plan to come to Zurich to address the conference but I was realistic as well. "I decided to err on the side of caution but also continue with the conference and move the tension with a great speech, which I believed I could." Sexwale, whose working life has also included spells as a politician and football administrator, refused to blame Caf for failing to back him. But he did label the latter's decision to publicly back Sheikh Salman as "risky". "The fact is that associations have their own minds and vote the way they want to vote," Sexwale said. "It's always a risk when an executive gives a guide about which way to go, because the association will go the way it has been instructed by their own members." "The Caf executive members also exercised their choice. They took their decision [but] it did not succeed." Prince Ali of Jordan and Frenchman Jerome Champagne were the other presidential candidates in Friday's vote.